This team composition also features a gank heavy composition, but focuses less on last week's team fight powers and more on creating chaos during all points in the game. With good synergy, this comp can quickly stomp a less coordinated team via their high powered roams and powerful engagement tactics. This team composition features another gank heavy composition, but focuses less on last week's team fight powers and more on creating chaos. With good synergy, this comp can quickly stomp a less coordinated team via high powered roams and powerful engagement tactics. Ezreal [Marksman] - Playing Ezreal allows your team to move Alistar around the map freely to gank other lanes and the jungle. As an extremely safe marksman, pinning Ezreal down is difficult as long as the map is well warded. He also gains back via Kleptomancy any lost gold from CS due to being zoned while Alistar roams. Aurelion Sol [Mid] - When it comes to early game waveclear and powerful roaming tactics, few do as well as Aurelion Sol. His ability to instantly clear waves and gank enemy lanes is very potent. From start to finish, a good Aurelion Sol can keep pressure on the entire map. This team also has very good gank power support to facilitate successful ganks. Alistar [Support] - Alistar is such a fun support to play. His ability to engage at will with minimal damage taken is incredible, and he can set up ganks to great effect. Even if the enemy champions are huddled behind their turret, he can knock them out of safety back into the danger zone. Evelynn [Jungler] - In this scenario, any early game jungler will do such as Shaco or Lee Sin. However, Evelynn in her current state is simply so powerful that pushing her onto team compositions is simply the best choice possible. Sion [Top Laner] - It's tempting to run someone like Pantheon for his early game power and mid-game roam. However, Sion's wave clear is much stronger and allows him to scale into the late game harder. His crowd control combos well with Alistar to create massive disruption to enemy teams and gank enemy lanes at will. Limit enemy vision for maximum gank potential. Once they get targeted a few times by Aurelion Sol or Alistar roams, they'll quickly learn not to leave the safety of their turrets. That's when you go behind them and knock them away from their pillar of hope. Countering this team mostly involves playing high mobility champions that can evade the enemy team and split push to victory without getting caught. Kassadin [Mid] - Keeping the knowledge that Aurelion Sol will roam in mind, warn your bot lane and free farm while Aurelion Sol goes off to chase his own tail. Udyr [Jungle] - Counterjungle the living daylights out of Evelynn and open da gates. Shen [Support] - When the enemy team is running high powered roaming compositions, playing Shen support allows for additional split-push power without sacrificing your main tanks. Sivir [Marksman] - Surviving against this type of team can be difficult, but Sivir has one of the highest survivability ratios in the game. Try Unsealed Spellbook Sivir for extra potential! 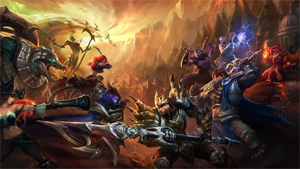 Overall, this enemy team composition needs more coordination and has a weaker early game, but can dominate the team above if they survive to mid-game without dying or succeed in early jungle invades.